Aussie grunge revivalists creating a buzz with everyone from Sonic Youth to Rick Rubin. Who are they? Aussie grunge revivalists creating a buzz with everyone from Sonic Youth to Rick Rubin. 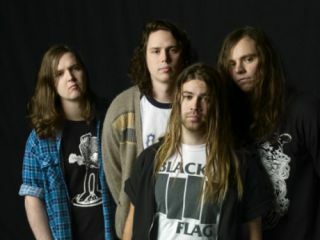 Sounds like: The grunge edge of Silverchair cushioned by the indie sensibilities of The Vines. But don't call them the new Nirvana, please. Why should you check them out? Because they're the latest in a line of Aussie grungers evoking the spirit of a genre enjoying something of a resurgence thanks to the reformations of heavyweights like Alice In Chains and Soundgarden. Drummer Michael Richards takes a fairly meat and potatoes stance when it comes to laying down his beats, but that's all that's required to turn a bunch of crunching riffs into rock anthems. Who said Airbourne were the only Aussies still rocking?